UCL has released a new study which shows that immigrants contribute more to British finances than is expended on them and are less likely to claim benefits or housing. Since 2000, it shows immigrants have contributed £25 billion to the British economy. So much for all the Tory/New Labour/UKIP hysteria. But unfortunately reality rarely intrudes on this fear-driven campaign. David MacIsaacs, a respected head teacher at a Scottish school, who is married to a British citizen, is being deported after living 10 years in this country. I myself nearly suffered a similar fate after living 8 years in this country and paying tens of thousands in taxes. This debate is even more poisonous across the Atlantic, and it is poignantly highlighted in a new documentary “The Dream is Now” by Academy Award-winning director Davis Guggenheim. The film tells the story of those directly affected by the immigration system, especially the undocumented children of immigrants. Last year I had my unpleasant run in with the UKBA. Because my bank balance had fallen below the required minimum of £800 in the final months of my PhD, the UKBA refused to renew my visa and I was asked to leave. 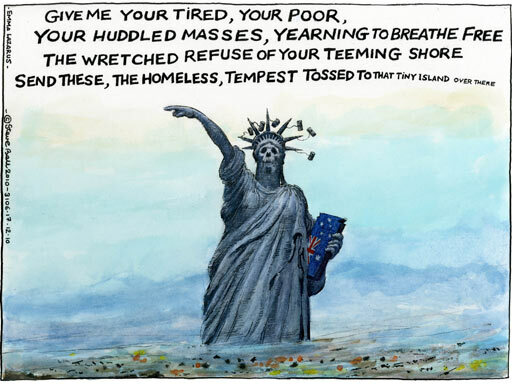 The grounds for rejecting my visa were that I couldn’t meet the UK’s ‘maintenance’ requirements, even though I had been in the country for over 7 years, paid taxes, and contributed to the economy in myriad other ways. More importantly, I had just been hired as a senior lecturer at a UK institution of higher learning, so my capacity to earn wasn’t in any doubt. In the end I had to appeal the decision, go through months of uncertainty, and finally have the decision over-turned only after a campaign in my support by leading academics and intellectuals. The Scotsman and BBC Scotland were also immensely helpful in publicising my case. I thought my case was outrageous enough; but now a couple of thousand others find themselves in a similar situation thanks to the UKBA’s decision to withdraw the London Metropolitan University’s license to sponsor foreign students. In the video below you can hear some of them. Worse, Professor John Tulloch, a respected UK academic, a 7/7 survivor, has also been stripped of his British passport because of an absurd technicality. In pandering to the xenophobic right, the government is gambling with the future of British Higher Education. This is madness at a time when a collapsing economy could really benefit from the money that foreign students bring in. Earlier this year 68 chancellors, governors and university presidents had written to David Cameron, warning him against the strict immigration policies that were going to lead foreign students to go elsewhere, costing the British economy billions. Universities are feeling the strain and the government is trying to place the burden for the lost revenue on home students, who are now made to pay exorbitant fees for degrees. This usually means the diminution of choices for students as they come under pressure to chose profitable disciplines. Social sciences and humanities inevitably suffer. The collapse began under New Labour, when education funding was slashed and top-up fees were introduced. Academic performance became less important than economic viability; highly regarded institutions such as Middlesex University’s philosophy department were shut down because they were no longer seen as being profitable enough. Things are now much worse. Universities spend more time marketing to a dwindling pool of students, academics spend more time chasing grants, managers spend more time searching for superfluous academics to lay off. It’s dog-eat-dog. It is unclear how bad things will get before those in authority reconsider the wisdom of their current policy. Academics have certainly done nothing to engender such reappraisal. The unions are compromised and for now most are just busy fending for themselves. Also worth reading are Craig Murrays immensely important observations on the LMU scandal. Josh Rushing brings another episode of Al Jazeera’s excellent Fault Lines. The detention and deportation of immigrants has reached an all-time high under the Obama administration. Fault Lines investigates the business of immigrant detention and finds out how a few companies are shaping US immigration laws. The images of a small, rickety boat full of asylum seekers being thrashed by the waves off the coast of Christmas Island are unforgettable. As remarked by a witness who watched in helpless desperation, it was like being in a horror movie, minus the relief experienced at the end when the lights come back on and the audience is allowed to return home. It was a nightmare without the awakening, a tragedy that should not have happened, not to those who perished — the children, the women, the men — or those who were forced to watch from nearby cliffs. The dead now number 48, but many more have yet to be accounted for. They were Iraqi, Iranian and Kurdish women, men and children who left everything behind in search of a better life. They fled from the destruction of war, from the festering wounds left by forced democracy, and from the unbearable struggle of making ends meet, towards what they imagined as a better future. Sadly, this tragedy is not the first, and will not be the last. It was however the most visible yet, because it happened before the eyes of the anguished locals on the shore, and millions more who saw the images in papers or on their television screens. Many similar tragedies happen every year less visibly though, in a hushed and subdued manner. No one knows exactly how many people perish on their way to the ‘Developed World’, but the number of people who are believed to have drowned in the past decade is in the thousands, and this only accounts for people lost while crossing the Mediterranean basin. Al Jazeera — Unwanted, marginalised and defiant – the Roma people have become the target of governments across Europe. Mexican actor/director Gael García Bernal and British director Marc Silver have recently collaborated with Amnesty International in a series of four short films, entitled “The Invisibles”. 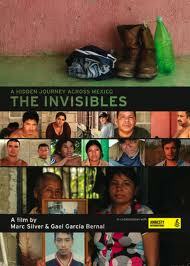 The films draw attention to the plight of Central American immigrants traveling across Mexico in order to reach the U.S.
Watch “The Invisibles” here, and read Amnesty’s full 2010 report entitled “Invisible Victims: Migrants on the Move in Mexico“.